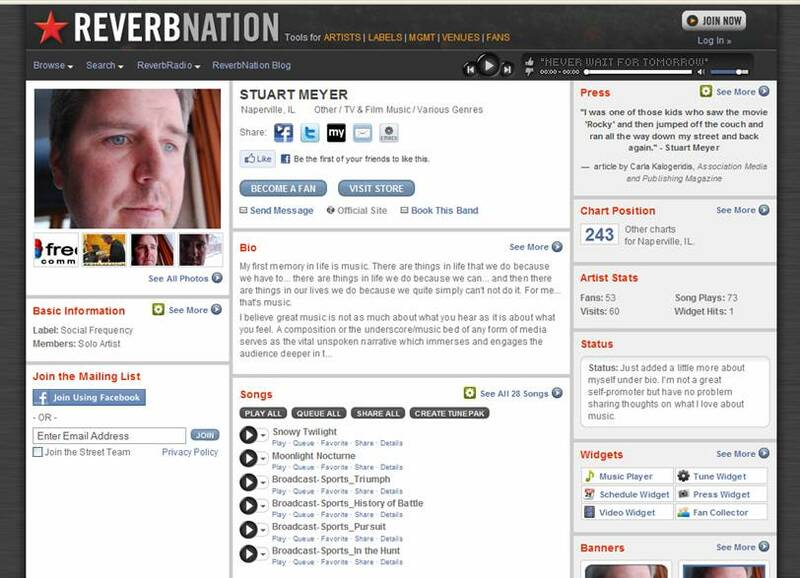 The procrastination has ended and I finally built a social “home” for a portion of my own music library on ReverbNation . If you are already knew I was a composer and music producer, then simply click hear to visit my page, listen to music and, fingers crossed, help me spread the word . I composed my first piece of music at age 10 and had originally planned to pursue a career in music. After several detours in life brought about by fear, insecurity, shyness, false starts and allot of trial/error I’ve spent the last 10 years putting myself and my music out there, mainly through my work in independent film. Nonetheless, music has been the greatest constant in my life and over the years and regardless of the path I was on, I’ve never stopped composing, writing and recording. What I’m about to say may hopefully seem more fascinating after you listen to a few of 28 tracks presently posted, but to this day I’ve not made a single cent for my music, volunteering my services for each director/producer I’ve work with up this point… still it remains one of the most gratifying aspects of my life. I always tell people that if you go into film or music first and foremost to make money, you’re certainly going into it for the wrong reasons. But if you have a relentless passion, a devotion to your art and focused persistence then one day the opportunities will arise. This is where I’m at and why I feel the need to get this music out to a larger audience beyond my immediate network of collaborators. In May, the World of Naperville will be celebrating it’s 5th anniversary. To date, this little blog about our small town in a big city has surpassed the 110,000 visit mark. While there have been months that are very active in terms of content and others not so active, I’m still very proud to be able to provide this volume of content about Naperville. Like any town or city, we’re far from perfect and certainly have our fair share of flaws, but it’s the celebration of the unique energy, the simple moments and vitality that ultimately matters in the end. To those who truly know the real spirit of Naperville, you know that the overwhelming majority of us are nowhere near the stereotypes and images perceived by others and depicted in some local publications. For the most part, we’re just another Midwestern town with an affection for “community”, the belief in helping others and the desire to live in a place which provides many opportunities and ways for us to enjoy life with our friends, families and neighbors. Given my roots, I live by the belief that there is a little bit of “small town” in every city, no matter how large. In the end, it’s the human and social capital… the energy, the accountability and the pride of those who inhabit a block, a neighborhood, a town or a city… which makes a community extraordinary and these are qualities which simply cannot be purchased with money at any price. I am pleased to announce that as of today, the World of Naperville has humbly reached the 10,000 visit mark and continues to grow at a strong pace. To the residents, countless Google searchers and the curious, I would like to extend my personal thanks for the opportunity to share with you a deeper insight into the community that I and so many others are extremely proud to call home. As a result of reaching this milestone, I’ve been reflecting recently upon my initial inspiration for starting the World of Naperville blog. Though I’ve pursued a number of community involvement opportunities, including participation in the Naperville Citizen Academy and other excellent causes, I’ve unfortunately been quite limited in my activities mainly because I commute to Des Plaines each day for work. The reality of commuting a total of 2 hours and 15 minutes a day is a lack of availability to attend community meetings which take place at all hours of the day. Regretably, I’ve been forced to turn down many meeting invitations. Nonetheless, given my strong desire to participate in some form of community leadership role, I decided to take advantage of the emerging world of online social media to launch this blog as a way to make a contribution to our community in the form of promotion and insight. The results-to-date have not only yielded an opportunity to contribute but also has fostered many connections/conversations with community leaders, residents and non-residents alike. Steadily, average daily and weekly hits continue to grow and the 10,000 visit mark is a mere starting point for the momentum which the World of Naperville is experiencing. With your support and interest, we’ll be reaching the 100,000 visit mark in no time at all. 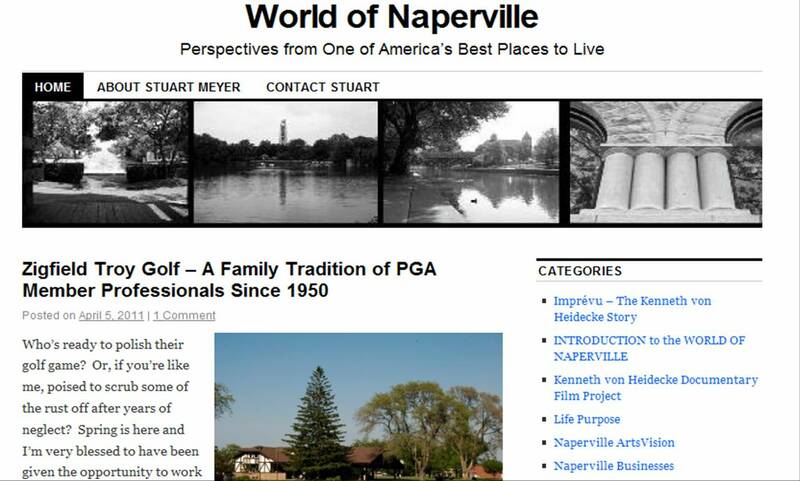 A couple of weeks ago, I welcomed NCTV 17 viewers to the World of Naperville blog after the airing of a special segment featuring the World of Naperville. Thanks to NCTV resident “jack-of-all-trades” Jeff Chow, I was able to acquire a copy of the segment which you will find posted below. I want to give special thanks to Halie Wenhold, who not only came up with the idea of featuring the World of Naperville but also produced the piece. I also want to thank Associate Producer Lindsey Theis for her involvement. Through this segment, I hope you will be able to get to know a little more about me, my inspiration for the World of Naperville blog and my passion for our community. Additionally, I also want to be able to promote the excellent work of NCTV 17 staff, interns and volunteers who work under the direction of Liz Spencer. To learn more about NCTV 17 or tune into it’s live stream, visit www.nctv17.com . I want to extend a special welcome to anyone discovering the World of Naperville blog for the first time as a result of seeing today’s NCTV 17 segment on the World of Naperville. As you may have a detected, like yourself and many others I have a deep passion for our community and decided to create this outlet to discuss all things Naperville. Originally, my friends and family thought I needed such an outlet so I would quit talking so much about all the wonderful things going on in Naperville; however, since launching my blog they can now enjoy my thoughts in both written and verbal form. Finally, I welcome you to provide your own comments via the blog or feel free to contact me directly with you thoughts and ideas at worldofnaperville@yahoo.com . Like many young adults who migrate to the big city of Chicago for its action-packed urban landscape, I found myself at an unavoidable crossroads back in 2003. I was married with one child and we were about to outgrow our 2nd story Roscoe Village flat which we adored on Chicago's Northside. I found myself a matter of blocks from the fabled Wrigley Field living just off of Addison. I was pursuing my dreams of composing music and writing songs for independent films closing in on the arts scene. With an increasingly inconvenient landscape for a fast moving 2 year-old and a desire to take the next step of the epic American dream in purchasing a home before our second little guy would come along, we were faced with the choice of staying in the city and settling for a small condominium or taking the same money to the "S" place to buy an actual house with some land. Yes, that's right… suburb city. I had convinced myself the only way I would go to the suburbs would be kicking and screaming. After all, in 1998 I moved to Chicago from Kentucky to be in the city, not the suburbs. Nonetheless, once I accepted my fate, I became focused on finding the perfect suburb that would combine the best of all worlds. I wanted to combine the cherished small town Main St. feel of my childhood in Kentucky with big city amenities. I wanted a place where I could live out my dreams community activism in playing a role which would help shape the future of my new hometown. I was in search of a vibrant community spirit with strong pride. A place in which I would feel a strong sense of passion and desire to be a part of. I found that and so very much more in a place I'm extremely proud to call home… NAPERVILLE. I consider myself and my family to be NEW NAPERVILLE, which can be characterized by those who hold the city in their hearts not because they were born here, but because the actively chose to live here in the same way Joe Naper and Naperville's early pinoeers traveled their way west from Chicago to settle Naperville amidst challenging circumstances, the least of which was the necessity of a fort to protect themselves from the original natives of the DuPage and Fox River Valley. Nowadays, I've emerged into such a Naperville geek that my friends and family refer to me simply as Mr. Naperville for the way in which I've learned about the history of my new hometown, stay up-to-date on local issues through the Naperville Sun, have already gotten involved in the community in a number of ways and my constant attempts to coerce everybody I know to come visit, or better yet MOVE, to Naperville. This BLOG is dedicated to what I call the WORLD OF NAPERVILLE. It's all about the experience of living in what CNN/Money magazine has called the second best place to live in America in 2005 (only because the categories were merged from the previous year when we were first). The WORLD OF NAPERVILLE is about the history, the happenings, the people, the places, the opportunities, the amenities, the arts, the experience, the attractions, the politics, the future, the spirit, the pride and the perspective of life in this charming little town in a big city through my eyes. I invite you to look around, share your thoughts and hopefully come visit us here in Naperville.